Today we’re hearing from Kirstin Underwood, biologist with the Gulf of Maine Coastal Program, as she teams up with partners to remove a dam in a remote section of the Sunday River in Western Maine. For me, the most rewarding thing about being a biologist is the chance to get outside, work hard and get my hands dirty. So when I heard about a dam that would be removed entirely by hand and human power in a remote region of western Maine, of course I wanted to be a part of it! The most interesting thing about this dam in the west branch of the Sunday River was that for a long time, no one really knew it was there. During historic logging runs of the 1930’s, several log dams were built in rivers throughout Maine’s Mahoosuc Mountain Range to flush lumber downstream from the mountains. Many disintegrated or washed away overtime, but the ones that remained were built to last. Jeff Stern of the Androscoggin River Watershed Council (ARWC), key partner spearheading this project, has a special talent for locating remnant dams in remote streams of the Androscoggin watershed. He discovered this fully intact 8-foot-high dam, built with massive white pine logs and foot-long metal spikes, sometime last spring. It spanned the river fully, blocking brook trout and other fish species from accessing important coldwater habitat upstream (great places to feed, spawn and escape the summer heat). Property owner Sunday River ski resort granted permission to remove the dam, and Stern got to work with other key partners (including Maine Department of Inland Fisheries & Wildlife (MEIFW), Project SHARE, the Maine Fish & Wildlife Conservation Office (USFWS), Trout Unlimited (TU), and the Androscoggin Valley Soil & Water Conservation District (AVSWC)) to make the removal happen. Getting to the west branch of the Sunday River was an adventure in itself. We followed a caravan of eager workers and volunteers along several miles of dusty old logging roads. When the road ended in an overgrown logging trail, we loaded grip hoists, pry bars, and all of our other gear onto an ATV and walked a half mile to the site. Our crew was a conglomeration of people and interests: 14 scientists, fishing enthusiasts and habitat restoration specialists from MEIFW, ARWC, USFWS, Project SHARE, TU, and AVSWC all showed up to provide labor and technical expertise. 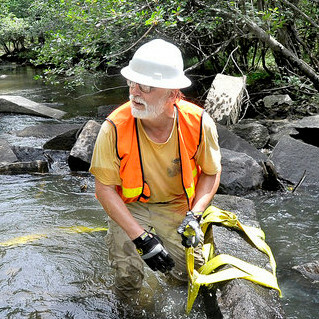 Everyone sprang to action, hooking grip hoist cables to the grid of 30-foot logs that were tightly wedged in the stream bed by years of sediment deposit. When three separate grip hoists were attached to the heaviest logs, it took all of our strength to crank the handles hard enough to shake the logs from side to side, even with help from a chainsaw to weaken them! Cheers resounded whenever painstaking effort on the grip hoist finally led to a satisfying crunch as another log was wrenched free. Jeff Stern (Androscoggin River Watershed Council), Emilie Seavey (DFP intern at Gulf of Maine Coastal Program Office), and Kirstin Underwood (Biologist at GOMCP) crank hard on griphoists to remove logs from the derelict dam on the west branch of the Sunday River. Upstream, USFWS biologist Scott Craig from the Maine Field Conservation Office uses a chainsaw to assist in log removal; Steve Koenig of Project SHARE and Alex Abbott of Gulf of Maine Coastal Program direct griphoist operations. Two days, four grip hoists, a few crowbars, and one exhausted crew later, water flowed freely through the dam and fish passage was significantly improved. Though a large chunk of the structure remained in the river, enough had been removed to allow erosion to restore natural stream processes. Days after we left the site, natural restoration had already begun; high water from a storm surge washed out a huge block of dirt and gravel that had been held back by the logs for decades. The best part of this project was actually getting out to do the work to restore fish passage, rather than sitting idly by to watch someone else do it. There is still work to do before the structure is completely removed, and I can’t wait to return to the site in fall or spring to finish. 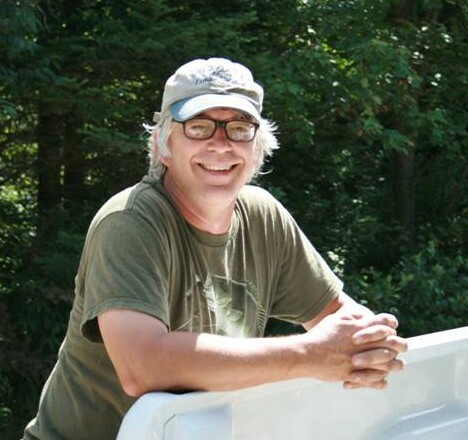 This project was funded through a grant with the Eastern Brook Trout Joint Venture, federal funds managed by USFWS. 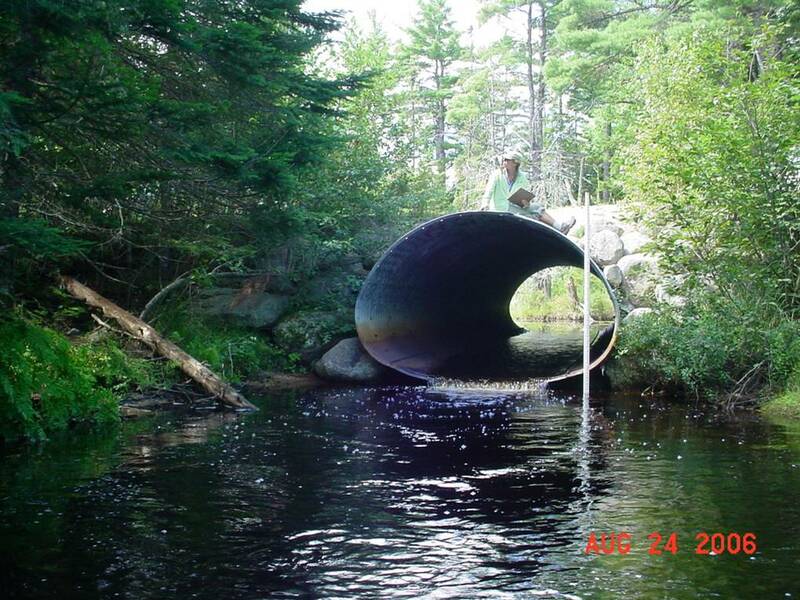 This entry was posted in aquatic connectivity, Blog entries, Partnerships and tagged Androscoggin Valley Soil & Water Conservation District, Eastern Brook Trout Joint Venture, maine department of inland fisheries and wildlife, Maine Fish and Wildlife Conservation Office, project share, Sunday River, trout unlimited on September 14, 2017 by U.S. Fish and Wildlife Service.